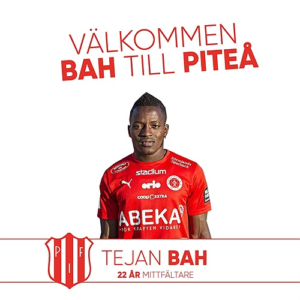 Officials of Swedish Division 2 side, Piteå IF, have expressed their faith in new Sierra Leonean signing, Tejan Bah, just after the midfielder put-pen-to- paper on a two -year deal. The 22-year-old defensive midfielder, who will be reuniting with his former coach at Hammarby Jeppe Mauritzson, attracted praises from Mauritzson and the club’s Sports Manager, Jens Hedström. “Tejan showed during the trial matches that he is a purposeful and professional football player who wants to continue to develop as an individual, but we also believe that he will help us as a team for better results,” Sports Manager Jens Hedström told the club website. “It has been a very constructive and a simple conversation with Tejan, and he feels that we are an association that can help him develop. We feel that Tejan fits is okay with both his football and personal qualities that we want to permeate the squad. Hopefully, we can benefit from Tejan’s defensive position play and his aggressiveness,” Hedström said. Bah, who had trials in December including a training match against Skellefteå was able to impress the management team to the extent that they decided to offer him a contract. And Coach Jeppe Mauritzson is pleased with the contract and went on to describe the player strengths as a football. “In Tejan we get a central midfielder that covers large areas, a skilled duel player and a person who, through his enormous ambition, will contribute to the group’s development in many matches as well as training,” Jeppe Mauritzson said. For the former Nyköping and Hammarby midfielder, he was delighted to reunite with his former coach and also secured the opportunity to play for the team. Bah played for Hammarby in 2012 and had time with both their U-19 and U-21 squad. He also went on to play for Nyköpings BIS and Varmdö IF and was considered as one of the best youth players in the 2014 Gothia Cup. The midfielder was not the only Sierra Leonean to have signed and played for Piteå IF. Ibrahim Kallay, played for the club for over two seasons.